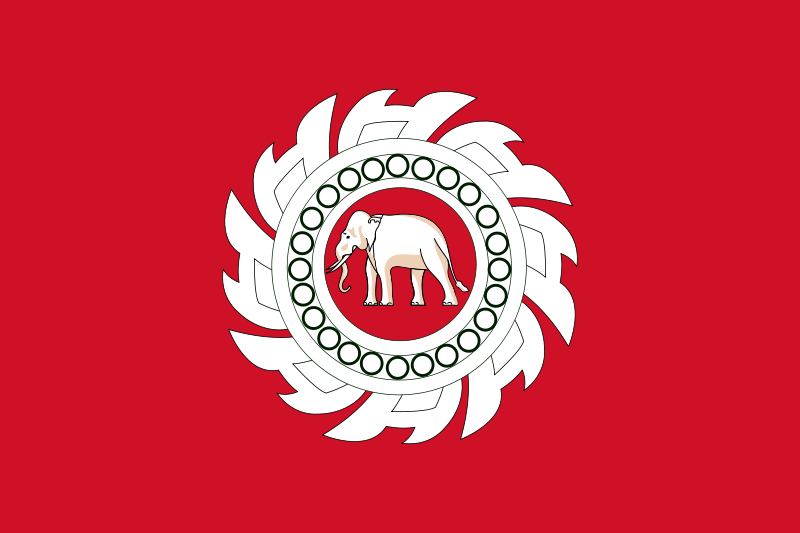 March 13th marks the 15th iteration of Annual National Thai Elephant Day (วันช้างไทย) – The Secretariat of The Prime Minister appointed this date since 1998 to attract attention to Thailand’s national symbol. 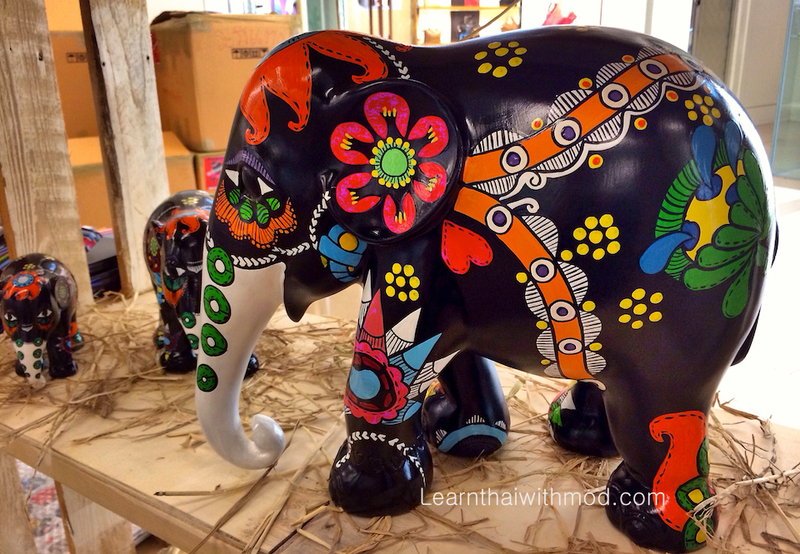 The National Elephant Day is not a holiday in Thailand. I don’t think a lot of people of the nation realize such a day exists. 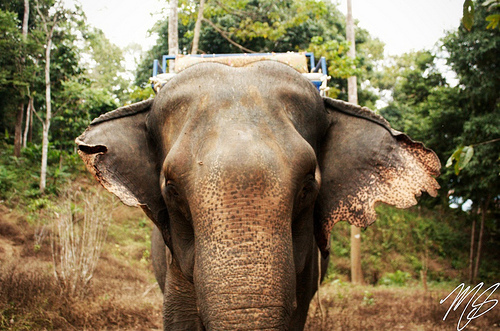 There are celebrations only in a few touristy provinces where there are elephant camps like Chiang Rai, Chiang Mai, Surin and Lam Pang. Last Sunday, I read an article in the Bangkok Post newspaper about a letter from the World Wildlife Fund (WWF) attended to the Thai Prime Minister, to reform Thailand’s ivory laws. More than one million signatories signed up to the WWF’s petition, as well as benefiting from the PR push from Leonardo DiCaprio, helped press the Thai government to take action. 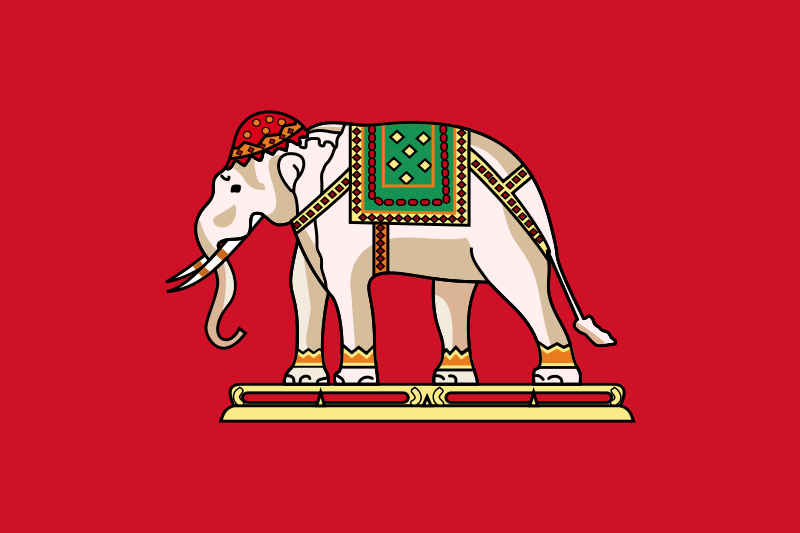 “Elephants are a national symbol, the mighty beasts of kings. Therefore it is only logical to the superstitious mind that persons of wealth and prestige must own ivory tusks. Ivory tusks do not only represent your rightful power and place in society, they also ensure the maintenance of said power and place, and lead to even more prosperity. With such beliefs, how can one resist? What’s more, the lowly poachers and commoners know not to keep the ivory tusks for themselves. By birth, they are not worthy of such a majestic symbol. If they don’t sell them to the powerful and prestigious, surely karma will damn their destiny for this lack of humility, this vain desire to jump the social ladder. One must know one’s place in society. Today, during my lunch break I read a local newspaper and found the sad news telling about a mother elephant, aged about 10 years ole, which was found dead because she was cruelly killed since someone wanted to take her baby away. The news also mentioned brutal killings of elephants in the past because of the ivory. It was such a horrible tragedy how the killed the poor elephants, not just the ivory tusks but forehead, mouth, tail and sexual organs were also cut off! I learned from a short documentary I watched that at the moment there are estimated 4,000 wild elephants and 3,000 domesticated elephants, while at the beginning of the 20th century Thailand’s forests teemed with a vast wild population estimated to be in excess of 300,000 with a further 100,000 domesticated elephants. One more thing that I was shockingly surprised to learn was the fact that a baby elephant that saw the mother elephant killed in front of his/her face would take six years to recover from the terrible memory and able to be friendly to human again, since its brain is similar to human’s. Imagine how you would feel if you see your family being murdered in front of your face. The baby elephant feels the same thing! 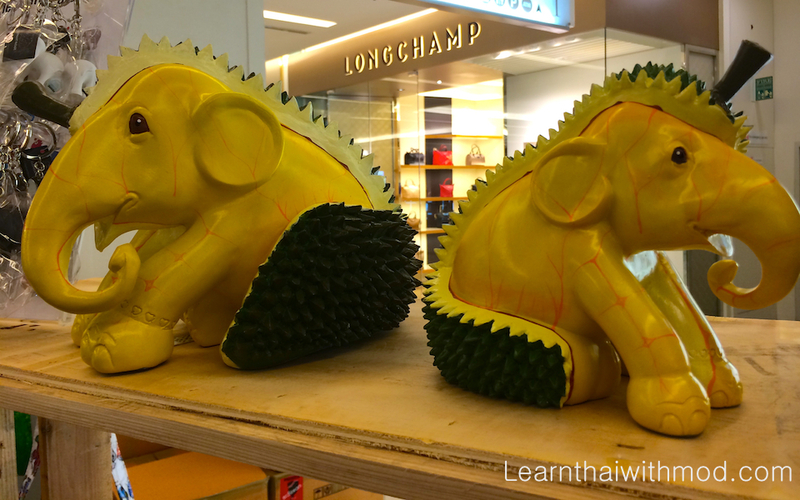 I truly hope that more Thai people will realize such action, and help to protect elephants before they are extinct and the later generations would only learn about elephants from the museum visits or reading the text books like we learn about dinosaurs. 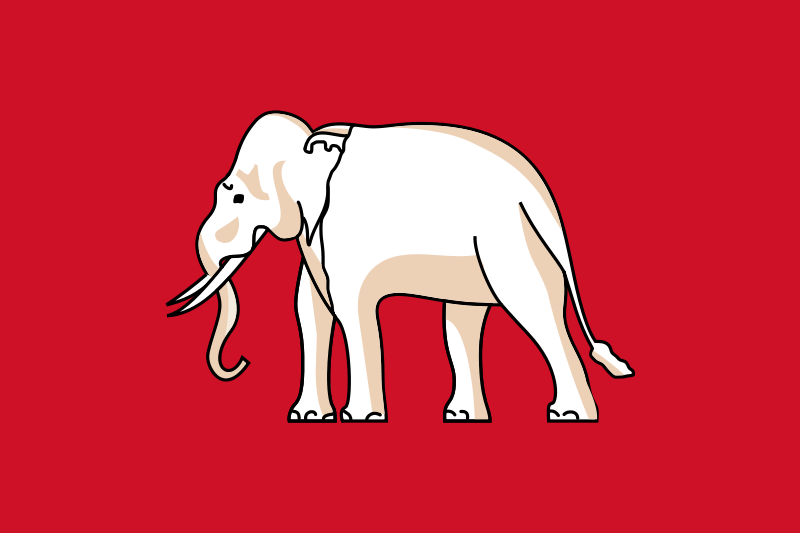 Fact: The flags of Thailand featured a white elephant on a red field. 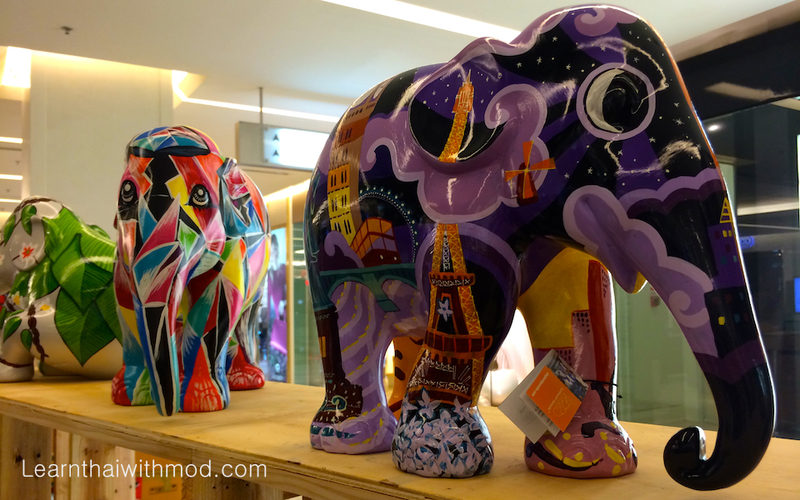 There is an exhibition to celebrate Thailand’s ‘Elephant Day’ showcase unique elephant sculptures created by famous local and international artists. 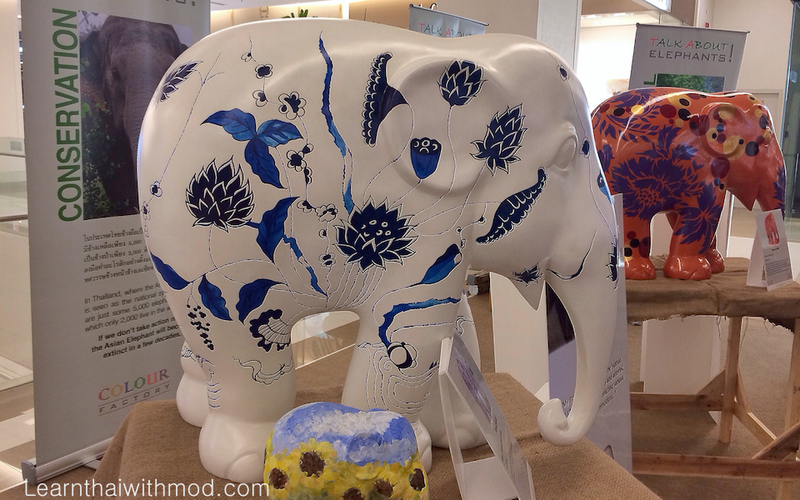 You can paint your own replica elephant too! (only 250 Baht). 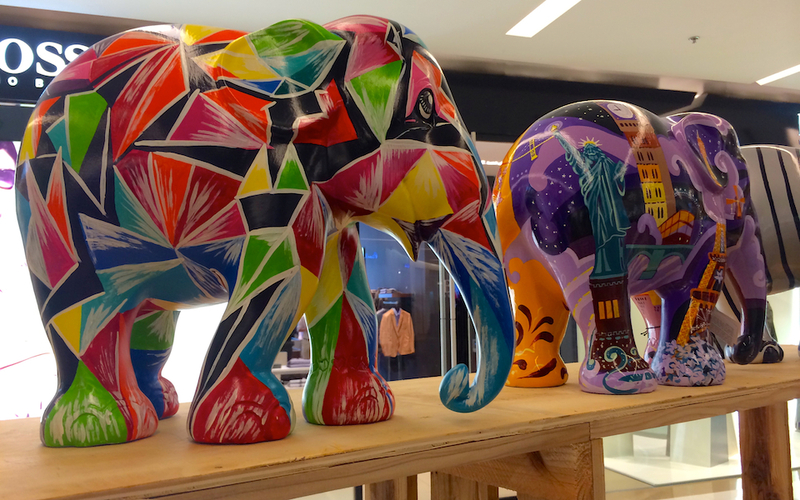 Part of the net proceeds from your purchase of the replicas are donated to The Asian Elephant Foundation, a foundation established to save Asian elephants. 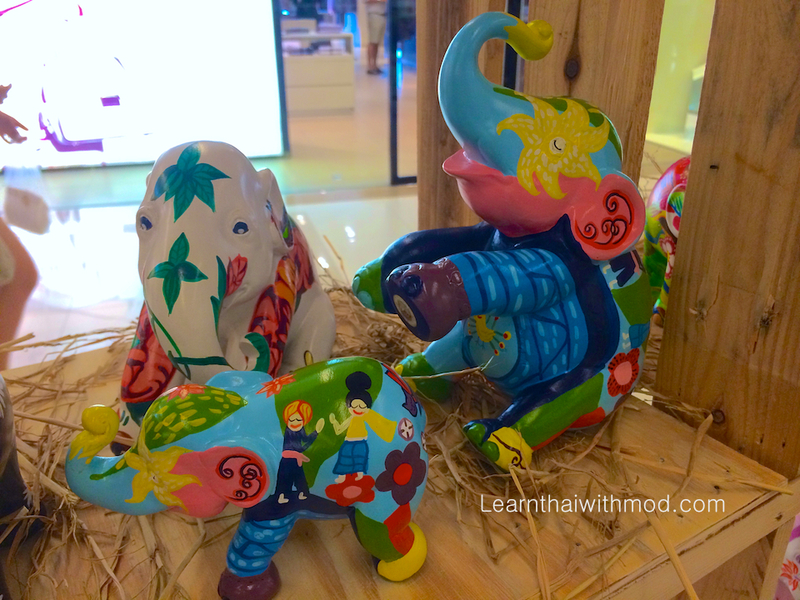 (The event is held 12th – 16th March at Siam Paragon mall). 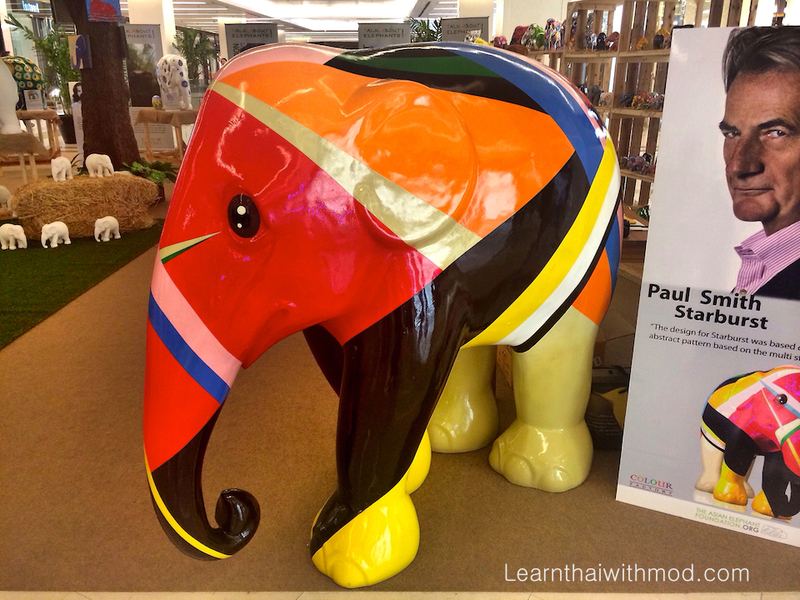 “Starburst” the artwork by Paul Smith displayed at Siam Paragon shopping mall in the exhibition. .. that includes any government supported protection centers, because it is a corrupt country. Such a pleasure to read Kru Mod.Well written. When you look at a map, looks Thailand not like a head of an elephant?